Two Room Suites:Units 1 through 5. 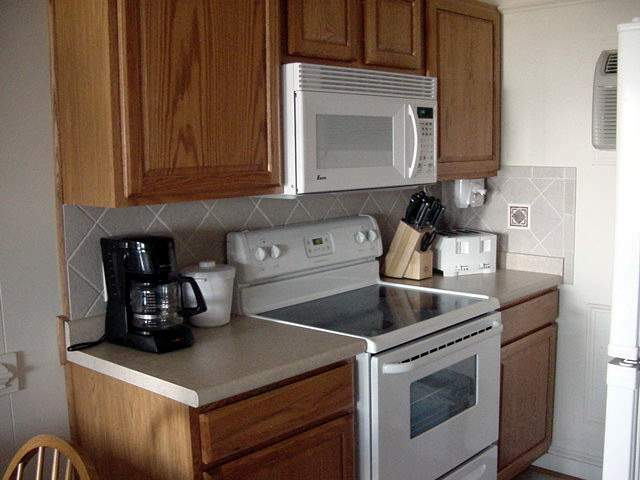 These units are located ground level and have limited handicapped accessibility. The doors are wide enough to allow wheel chairs to pass. The main room consists of a full kitchen, dining area, and sofa. The separate bedroom contains two double beds. Both the main room and the separate bedroom have their own televisions. 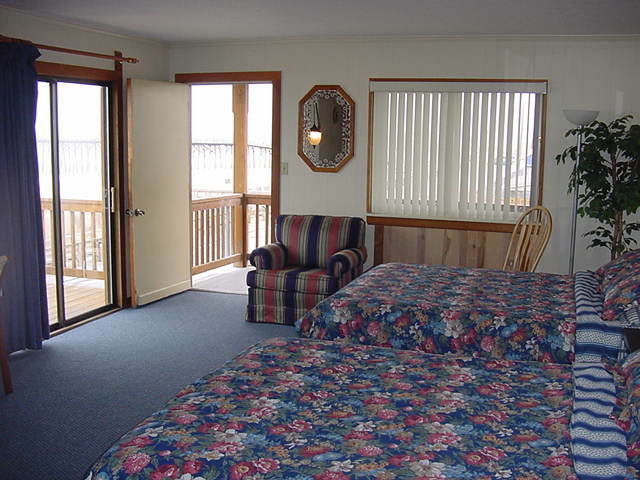 Room 1 has a 24 foot long private oceanfront balcony. These units will sleep up to four people. Some units are equipped with sleeper sofas to accommodate a fifth person, extra charges apply, please inquire. Units are equipped with two televisions. Units 12 though 15. 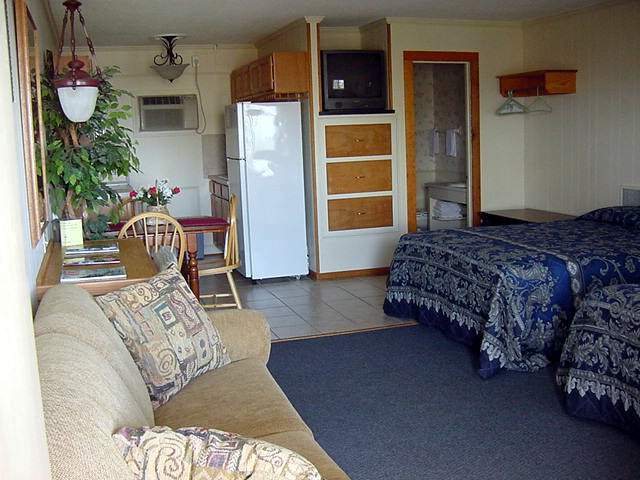 These units consist of two queen size beds and a full kitchen in one large (460 square feet) room. These units will sleep up to four people. Room 15 has a 24 foot private oceanfront balcony. 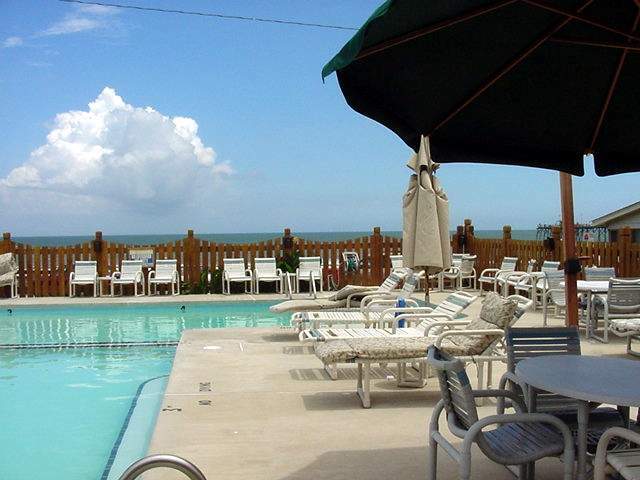 These units face South (except Room 15 which faces East) and have a beautiful view of the ocean. Some units are equipped with sleeper sofas to accommodate a fifth person, extra charges apply, please inquire. Units 6 through 9. These units consist of one queen or king size bed. 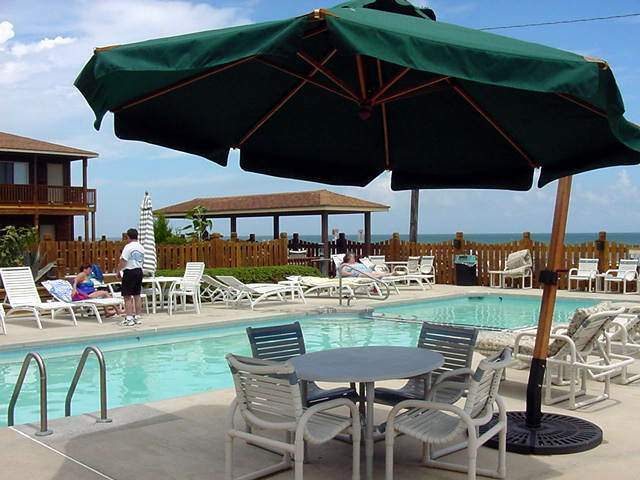 They are located ground level and are adjacent to the swimming pool. 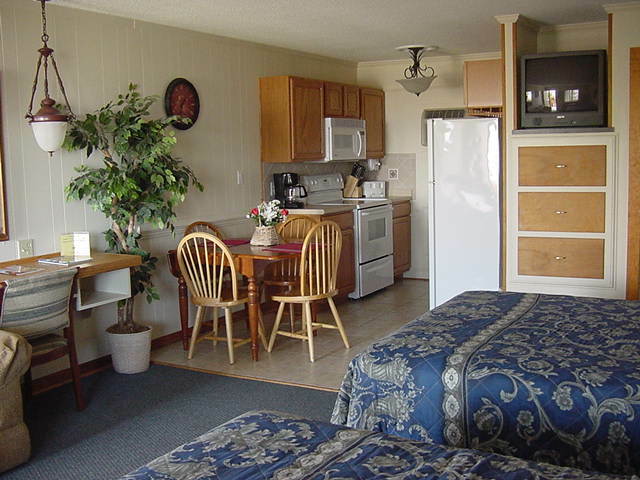 In room amenities include a refrigerator, microwave, coffee maker and 32" HD television. Units 16 through 33. All of these units face directly East towards the ocean and consist of two double or queen size beds. Units 16 through 24 are located on the second floor and units 25 through 33 are located on the third floor. Some units are equipped with sleeper sofas to accomodate a fifth person, extra charges apply, please inquire. All rooms features 32" HD televisions. These units feature shower / tub combinations. Adjoining units are located in this building. 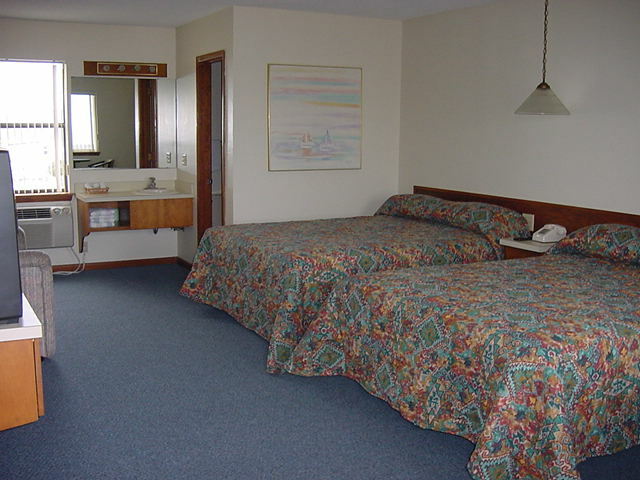 Adjoining units consist of aMotel Room (standard room with two queen beds and a refrigerator only) and an Efficiency (a Motel room with a full kitchen and dining table with chairs and two double beds) with interconnecting doors. 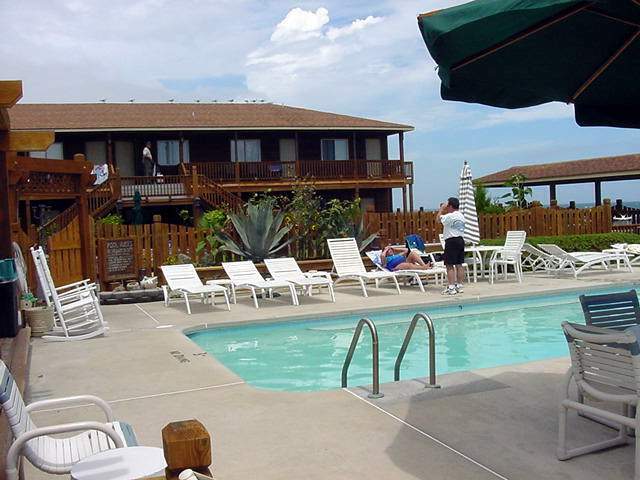 Provided with all rooms is cable TV with HBO, bed linens, towels (but not beach towels) and daily housekeeping services. In addition, all efficiencies provide basic cooking necessities as well as, microwave ovens, coffee makers and toasters. Email us if you have additional questions on room types or layouts or if you have special accomodation needs. Please Note that smoking is prohibited inside all of our rooms. Smoking is still permitted outside on the porches, balconies and other designated areas. Thank You for your past patronage, we look forward to seeing you this summer! Sorry, We do not accept pets! Dear visitor, please sign our guest book located on the Photo Gallery page.